Sharon is one of the gals who comes to my home to stamp. She is such a sweetie and we all love to hear her stories! She's such a delight. She is a very good stamper too and don't let her tell you different! Isn't this bunny card just the most adorable? I think it is absolutely the sweetest!!! And I think she did a fabulous job on it. 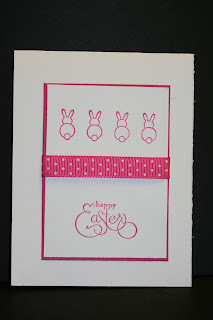 Happy Easter is from the "Well Scripted" set by Stampin' Up! This is a very easy and fun layout to play with. 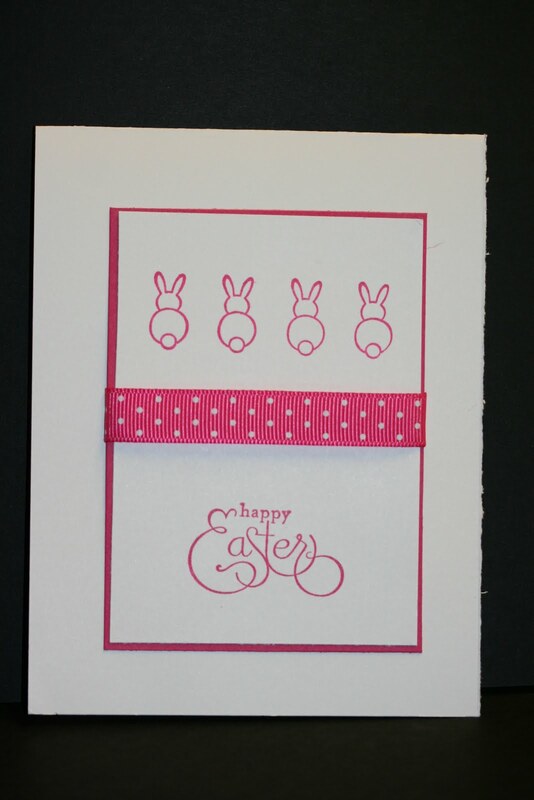 I have used it many times and I was glad that Sharon liked it and was able to use it on her cards! Didn't she do a fabulous job? Thank you for letting me post your card on my blog! You're famous Sharon!! Cute card! As I have the bunny butts stamp and the Well Scripted set, I may have to case it. Thanks for posting. Jelly Beans in a Cup! A VERY Ugly Thank You Card!